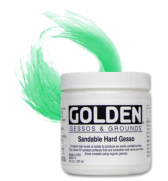 Sandable Hard Gesso is formulated with 100% acrylic polymer emulsion and can be sanded to provide surfaces that are smoother and more even than those created using regular gesso. 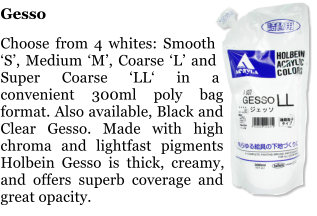 BASICS® Gesso is a value acrylic gesso used to prepare painting surfaces for acrylic and oil paint. Non-yellowing. Thick texture that levels evenly. Flexible and non-cracking. Good quality base coat primer. One coat is usually all that is required. Liquitex Gesso is a premium acrylic gesso used to prepare painting surfaces for acrylic and oil paint. Non-yellowing. Flexible and non-cracking. Provides the perfect "tooth" and adhesion to a wide variety of surfaces such as canvas, paper and wood. Excellent base coat primer for many applications for example murals. One coat is usually all that is required. Available in White, Clear and Black. 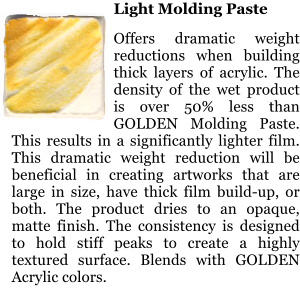 Glazing Medium For creating brilliant jewel like glazes with acrylic artist colors. Excellent brushing and leveling qualities. Dries quickly for rapid layering. Mix with any amount of acrylic color. Small quantities of color provide the most transparency. Works best with transparent or translucent colors. Flexible, non-yellowing and water resistant when dry. GAC 400: Fabric Stiffener / Rabbit skin Glue Alternative. Dries to a very hard and stiff film. Most useful for priming fabrics (cotton, linen, silk, etc.) when stiffness is desired. Used as a rabbit skin glue alternative when applied directly to raw canvas or linen. Allows sculpting and shaping of draped fabrics. Traditionally, rabbit skin glue (also known as hide glue) was used to reduce the flexibility of canvas before painting. Although the rabbit skin glue does reduce flexibility, it is extremely brittle. It is hygroscopic, which means that it will always be water-soluble. Even when the glue is completely dry, high humidity will re-introduce water into the film, causing it to soften or swell up. Over time, this constant swelling and drying of the film can cause severe paint-film cracking and delamination. GAC 400 can be used in a similar fashion for stiffening canvas. Apply directly to the front of the raw canvas for maximum stiffness. It is imperative that it be applied directly to the raw canvas. It is ineffective over any other medium, and most likely will flake off and cause delamination of subsequent paint layers. Since GAC 400 is not effective against oil penetration, the use of GAC 100 over GAC 400 is recommended for oil painters Note: Since GAC 400 is brittle, it is important that it not be rolled tightly, or bent back upon itself. This will cause cracking of the polymer film and may transfer cracks into additional paint layers. This is especially a risk with cured oil paints. 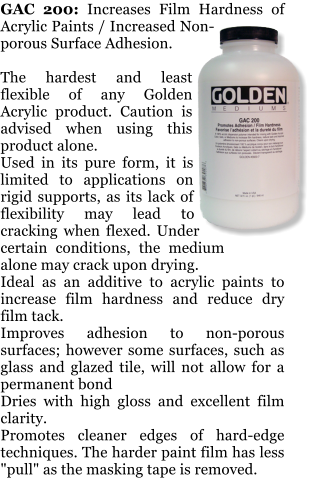 GAC 500: Self Leveling Applications / Hard Yet Flexible / Best Isolation Coat Medium for Spray-Application. Unique balance of film hardness and flexibility. Mix 2 parts GAC 500 to 1 part Airbrush Transparent Extender to produce a good spraying, fast- drying isolation coat. 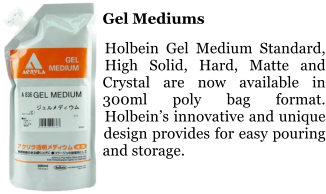 Beneficial as an additive for acrylic paints for increasing mar resistance and decreasing dry film tack, without disturbing the balance between hardness and flexibility. Useful when working on flexible or rigid supports. Offers a self leveling working quality. Dries to high gloss film with good clarity/transparency. Useful to hard-edge painters to seal masking tape for cleaner edges. Apply over masking tape. Let dry before applying additional paint layer. GAC 900: Increases Launderability of Acrylic Paint. 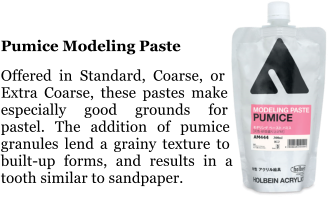 Designed to be used as a modifier for acrylic paints for painting on clothing. 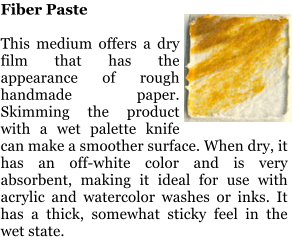 See the GOLDEN Acrylics on Fabric Application Information Sheet for more extensive information. Offers a soft, pliable feel and when properly heat-set, provides excellent laundering stability. 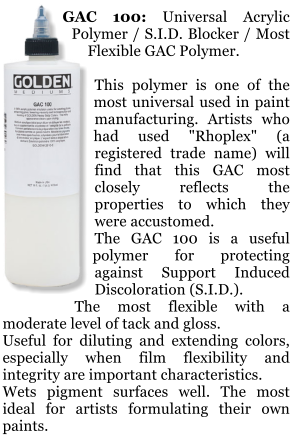 Blend with GOLDEN Heavy Body, Matte or Fluid Acrylics for brush or screen application. Mix with GOLDEN Airbrush Colors for "Tie-Dye" effects. Note: The heat-setting process will release low levels of formaldehyde; therefore it is imperative that adequate ventilation be provided. 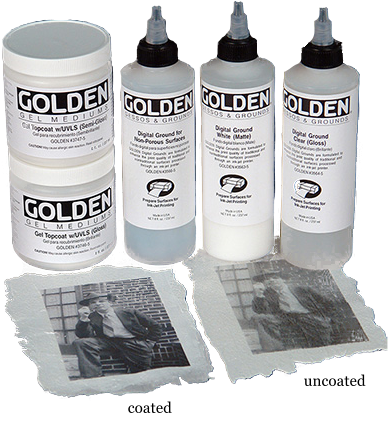 GOLDEN Silverpoint / Drawing Ground is formulated with 100% acrylic polymer emulsion. It is a low viscosity fluid that contains high levels of titanium dioxide and prepares surfaces to readily accept marks from a metal stylus. PRODUCT APPLICATIONS GOLDEN Silverpoint / Drawing Ground is designed for thin applications only. When applied too thickly the film may crack upon curing. A single thin coat is typically sufficient. It can be brush or spray applied to paper, primed canvas, wood or any surface that will accept a water-based coating. The most common substrate for metal point drawing is heavy weight hot pressed watercolor paper. Note: Because lower weight papers are susceptible to buckling from the moisture in the Silverpoint / Drawing Ground, some artists may find taping the edges down will help prevent extensive warping. 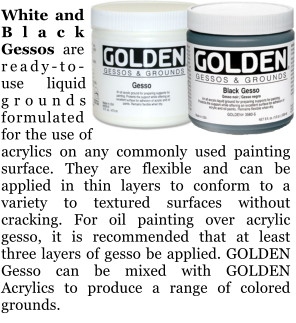 GOLDEN Acrylic Ground for Pastels is a 100% acrylic medium designed to prepare surfaces for the application of pastels, charcoal and other art media where a coarse tooth is desired. It contains finely ground sand (silica) in a pure acrylic emulsion. 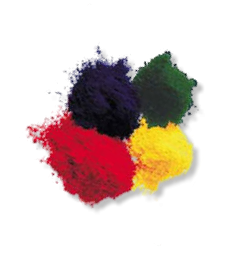 Acrylic Ground for Pastels can be applied to paper, canvas, wood or any primed support. This allows almost limitless applications for media typically confined to standard papers. 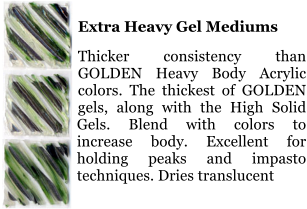 PRODUCT APPLICATION Thinning: Due to the weight of the solids in Acrylic Ground for Pastels, it is produced very thick, and does not come ready to brush-apply. Thin 20-40% with water to desired consistency. 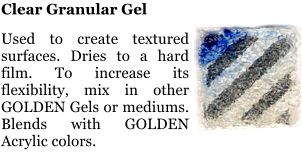 Application: Apply with brush, paint-roller, spray equipment, squeegee or palette knife. Mix up only as much as is needed for one day's work, as the solids will settle rapidly and be extremely difficult to mix back into suspension. Gloss Gel Dries to a gloss finish. Viscosity and body similar to Liquitex Heavy Body Artist Color. Dries clear to translucent depending on thickness of application. 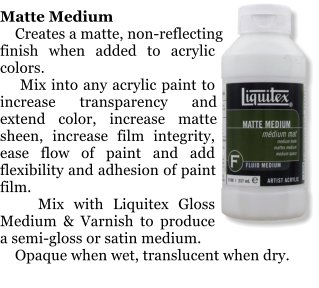 Ideal medium to mix with Liquitex Heavy Body Acrylic Color to extend paint, increase the brilliance and transparency of color, without changing the thickness of the paint. 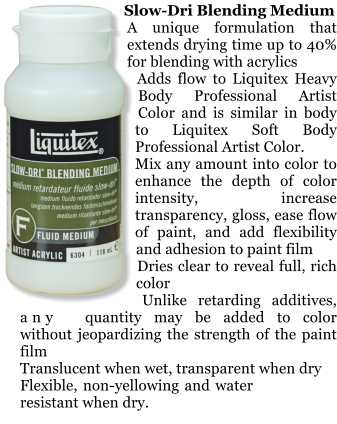 Mix with Liquitex Heavy Body Artist Color to obtain paint similar in color depth to oil paint. 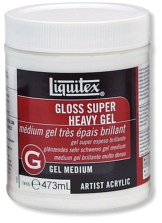 Gloss Super Heavy Gel Medium Extremely thick, extra heavy body. The thickest "clear" gel. Very dense, with high surface drag for a stiff "oil-like" feel. Dries clear to translucent depending on thickness of the application. Very little shrinkage during drying time. Excellent adhesion for collage and mixed media. Extends paint, increases brilliance and transparency. Keeps paint working longer than other gel mediums. Flexible, non- yellowing and water resistant when dry. Matte Gel Dries translucent with a satin/matte finish. 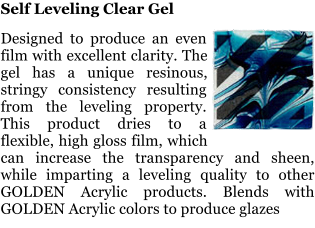 Viscosity and body similar to Liquitex Heavy Body Artist Color. 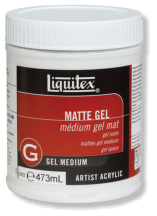 Liquitex Matte Gel Medium has greater adhesion than Liquitex Gloss Gel Medium and Liquitex Gloss Heavy Gel Medium. Translucent when wet, transparent when dry. 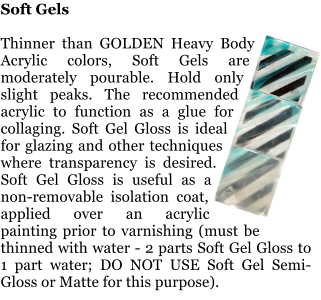 Thicker applications result in less transparent dry medium films. 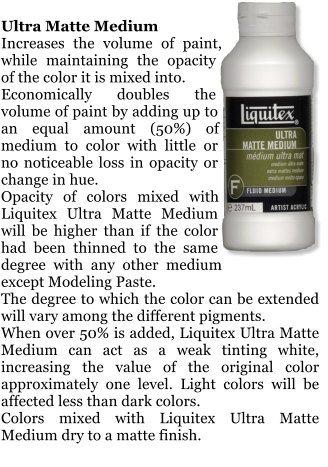 Mix with Liquitex Heavy Body Artist Color to obtain paint similar in color depth to oil paint. Color mix will dry to a satin sheen. Matte Super Heavy Gel Medium Extremely thick, extra Heavy Body. Heavy bodied, very dense, with high surface drag for a stiff "oil-like" feel. Dries to a translucent matte finish depending on thickness of the application. Very little shrinkage during drying time. Excellent adhesion for collage and mixed media. Extends paint. Keeps paint working longer than other gel mediums. Flexible, non-yellowing and water resistant when dry. Ultra Matte Gel Heavy Body. A translucent white gel of high density and high solids, that economically extends the volume of Heavy Body Artist Color without changing its heavy body Add up to 50% by volume, to double amount of paint and retain color position. If more than 50% is added, it acts as a very weak tinting white. 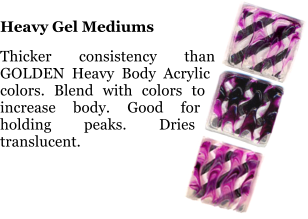 Maintains the opacity of the color better than using a clear gel medium. Dries to a matte finish, giving colors a matte sheen and gouache look. Slow-Dri Blending Gel A unique formulation for superior surface blending with acrylic paints. Extends drying time up to 40% for superior surface blending with acrylic paints. Similar in body to Liquitex Heavy Body Professional Artist Color. Mix any amount into color to enhance the depth of color intensity, increase transparency, gloss, and add flexibility and adhesion to paint film. Dries clear to reveal full, rich color. Unlike retarding additives, any quantity may be added to color without jeopardizing the strength of the paint film. Translucent when wet, transparent when dry. Flexible, non- yellowing and water resistant when dry. 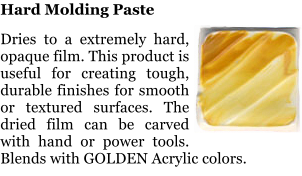 Light Modeling Paste A lightweight, airy, flexible, thick, sculptural gel specifically formulated to be used in thick applications where weight is a factor. Will not exhibit "mud cracking". Used alone, will dry to a matte opaque white that readily accepts staining if desired. 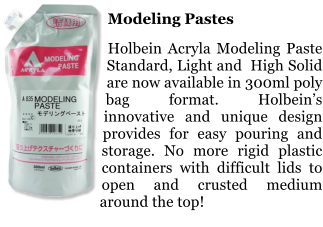 Flexible Modeling Paste 100% polymer emulsion that dries more slowly than other modeling pastes to a hard yet flexible surface. Used to build three- dimensional forms and heavy textures on supports that may be subject to flexing or movement. Adheres to any non-oily, absorbent surface. When mixed with acrylic colors will act as a weak tinting white, while increasing thickness and rigidity. Modeling Paste Extra heavy body and very opaque. A marble paste made of marble dust and 100% polymer emulsion. Used to build heavy textures on rigid supports and create three-dimensional forms. Dries to the hardness of stone. It can be sanded or carved when thoroughly dry. 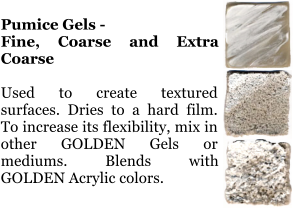 Can be handled like clay if the top of the container is removed and some of the water is allowed to slowly evaporate until it reaches a clay-like consistency. Adheres to any non-oily, absorbent surface. 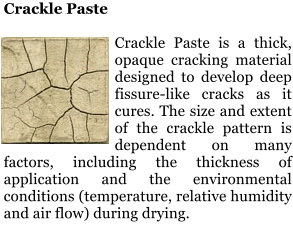 Drying too quickly causes mud cracking that is usually cosmetic, not structural. When mixed with acrylic colors will act as a weak tinting white, while increasing thickness and rigidity. 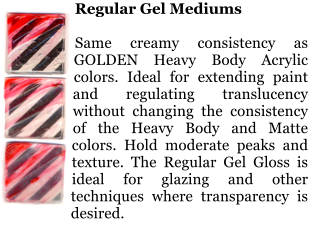 Excellent substrate for acrylic paint, oil paint, oil pastel, oil bars, watercolor, graphite or dry pastel. 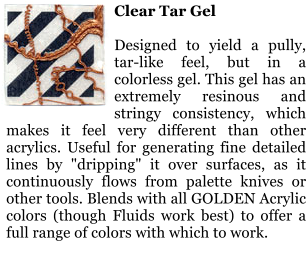 Fabric Medium Enhances the workability of acrylic paint on fabric. Controls bleeding of colors thinned with water. 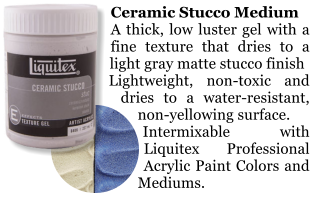 Provides a smooth, consistent flow when added to Liquitex Soft Body Artist Color. 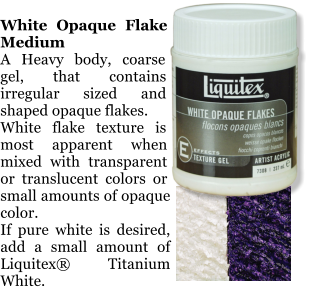 Prevents uneven application of paint to rough textured fabrics. Reduces stiffness of dried acrylic paint on fabric. Eliminates the need to scrub or abrade rough textured fabrics to enable paint to adhere or penetrate surface. Does not require heat setting. Iridescent Medium Produces a range of iridescent or metallic colors when mixed into acrylic colors. Opaque when wet, transparent to translucent when dry. Will not oxidize. Application: Mix with small amounts of color, gradually adding more color until desired iridescent quality and transparency is achieved. Transparent and translucent colors work best however opaque colors can also be used. Color will become more transparent as percentage of medium increases. Colors increase in their iridescent quality and become much more reflective upon drying. For mother of pearl color, use directly from container. For use on fabric, thin 50% with water. Airbrush Medium Low viscosity. Ready to use pre-filtered and pre- reduced to the required consistency for airbrush techniques, add as much or as little as desired. Formulated for thinning acrylic colors for airbrush application. Ensures colors do not lose flexibility, durability and adhesion. Easily thins acrylic color or any water-soluble paints to a spray-able consistency. Allows thinned acrylic paint to be sprayed efficiently and retain paint film integrity. 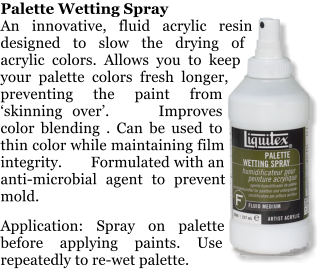 Airbrush Medium mixes easily with all Liquitex Soft Body Artist Colors to produce airbrush paint with the proper viscosity for airbrushing. Can also be mixed with Liquitex Heavy Body Artist Colors. Can be mixed with all Liquitex paint, mediums and gesso. String Gel A self-leveling gel with a syrupy, honey-like consistency. Enhances depth of color and increases transparency and flow. Dries glossy and transparent. Permanent, non-yellowing, flexible and water resistant when dry. Application: Pouring or dripping the gel from above produces a long, string-like application. Mix with acrylic color and brush to create long streaking effects, as well as to enhance depth of color. Pouring Medium Creates even “puddles,” poured sheets, and flowing applications of color. Does not craze, crack, or hold bubbles in the paint film upon drying. Retains high gloss and wet appearance when dry. Will not add transparency when mixed with color. Flexible, non-yellowing and water resistant when dry. 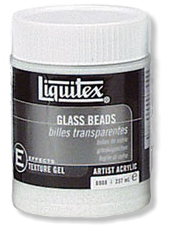 Glass Beads An acrylic medium body gel that contains clear, round aggregates that dry to a semi-gloss, reflective ("bubbly") surface. For most dramatic reflective effects, mix with transparent or translucent colors or apply straight from container over dried paint. 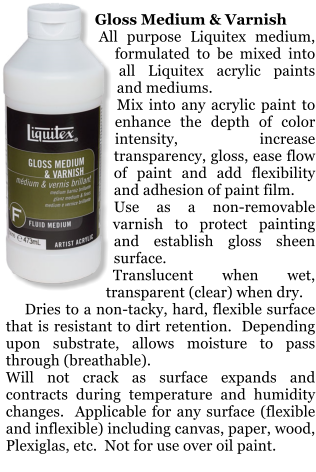 For reflective textural glazes, mix with Liquitex® Gloss Medium & Varnish and small amounts of Liquitex Soft Body Artist Color. Suitable as a ground for acrylic and oil paint. Works well with brush application. Blended Fiber Medium A thick, fibrous gel that gives the effect of flexible fibers when dry. 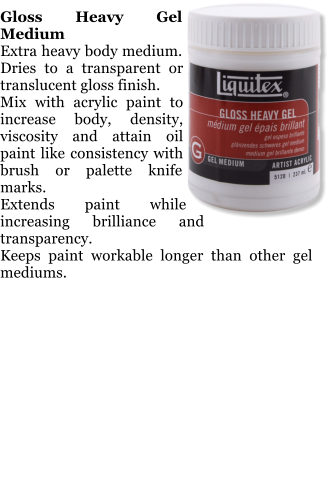 Add Liquitex Gloss Gel Medium or Gloss Heavy Gel Medium for easier application and to increase adhesion while wet. Works best when applied with palette knife or trowel. 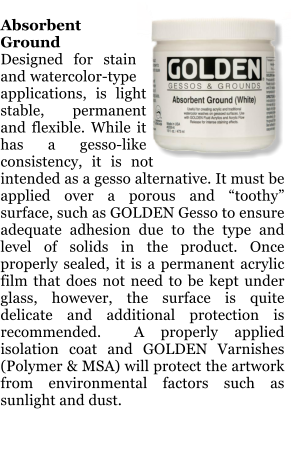 Grounds for Digital Imaging Digital Grounds are ink-receptive coatings intended for use with ink-jet printers. With them artists can coat and subsequently print over a variety of substrates including paper, canvas, metal and acrylic paints, using ordinary computer printers and inks. For more information on GOLDEN Digital Grounds, see the Digital Ground Product Information & Application Sheet. 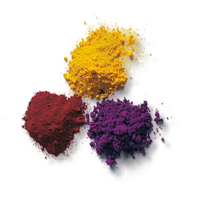 Golden offers three Digital Ground formulations: Digital Ground White (Matte) is A semi-opaque white ground for printing on porous and non- porous surfaces. It provides a smooth and absorbent surface for printing inks to dry rapidly. It is an ideal starting product for artists exploring digital printing. 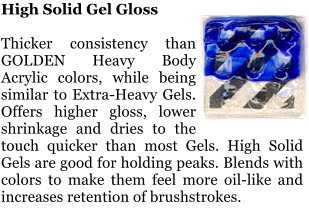 Digital Ground Clear (Gloss) is a for use on most porous surfaces where clarity is desired to view underlying materials. Digital Ground for Non-Porous Surfaces is a clear gloss ink-receptive coating for use with ink-jet printers and is suitable for coating non-porous surfaces, such as plastic and metal. Extender Extender for Rolling, when added to Metallic Paint Collection paints, extends the open time or ‘wet-edge’ of the paint. This added open time allows for ‘back-rolling’ as a last step to properly orient the metallic particles and eliminate seams. Tintable Glaze This translucent and durable water base glaze has one-hour “open time”, with optimum viscosity for maintaining textures on vertical surfaces. 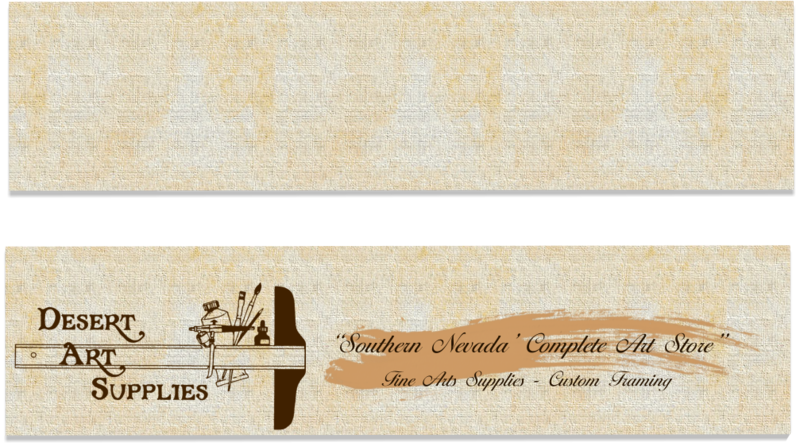 Use for any decorative paint/faux finish such as Marbling, Wood Graining, Exotic Mineral, Bone, and Overglazing. The glaze can be tinted with universal colorants or our ShimmerStone colorants. Do not tint with paint. If a longer “open time” is desired, add Extender for Latex Paint. Dead Flat Varnish This premium quality, water base, non-yellowing Dead Flat Varnish is a water base clear finish coat formulated to have the optimum level of clarity with the least amount of sheen. They will remove undesirable variations in sheen created by using semi-gloss base coats with Decorative Glazes and allows the finish to maintain that aged effect.